Please understand that Mr. Moore wrote these articles many years ago. 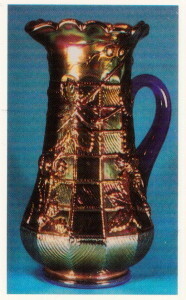 This one is from June of 1990. If prices are included, they reflect the period when this was written. 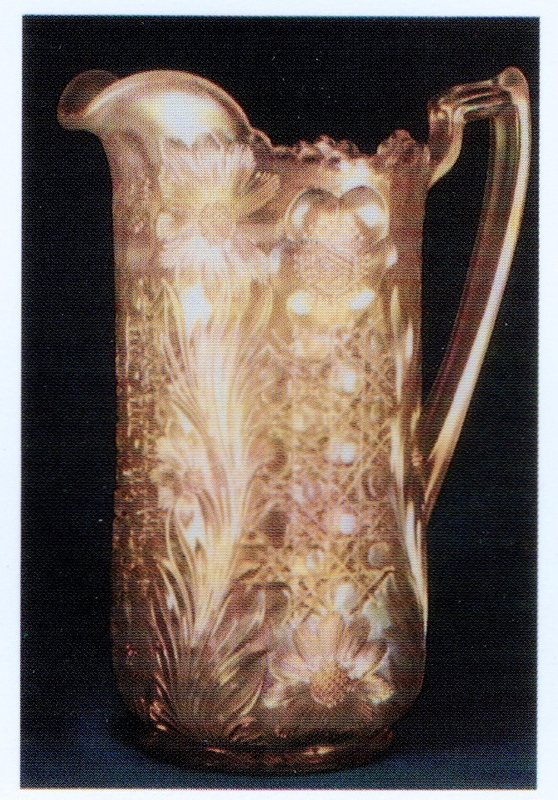 Twenty years ago when carnival glass collectors got together, water pitchers dominated the conversation. 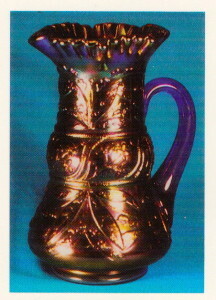 Today it’s hard to get anyone to talk about anything but pastel bowls, plates, compotes, and vases. I fear that our excesses in connection with water pitchers, several years ago, is being repeated today with our passion for pastels. 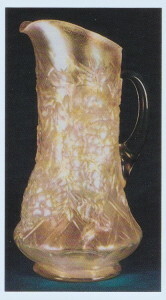 Many water pitchers will sell for less today than they did twenty years ago. Unless we are careful, we may be headed for the same decline and fall of our beloved pastels. This is being written some two years before it will be published but in the last available auction price guide, an ice blue Peacock on the Fence pie-crust edge bowl sold for $3000. 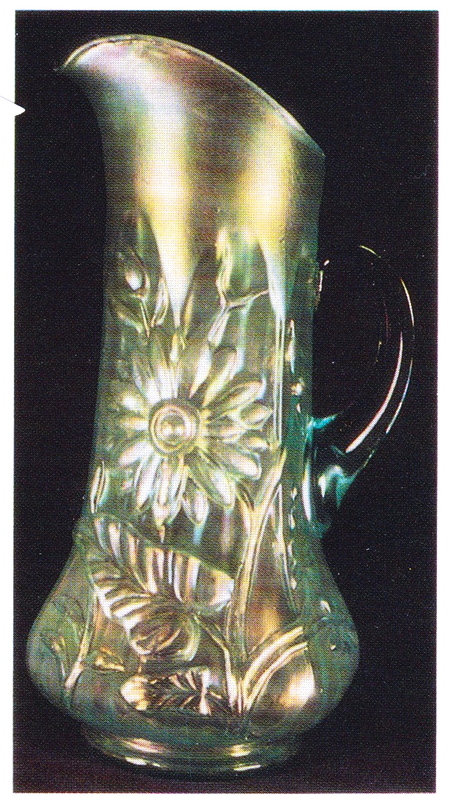 At about the same time (March 1987) a purple seven piece Northwood Dandelion water set brought $700. In my opinion something is out of kilter. It has always been my feeling, that true carnival collecting centers around water pitchers. 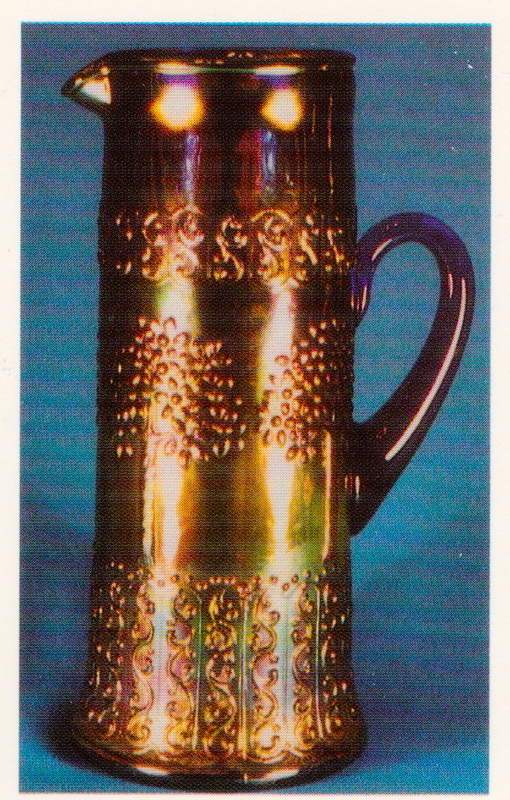 Take a look at the color inserts on tankards and ask yourself if there is any shape in carnival glass that can equal the variety, the elegance, and the stature of these pieces. 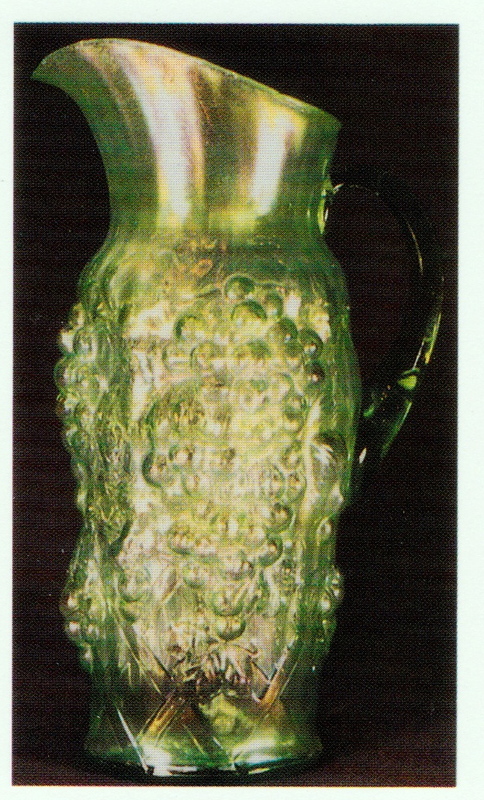 I feel strongly that water pitchers are destined to rise again and take back the center stage they once occupied. This may sound like a sales pitch for pitchers and I guess it is. I make apologies as I feel they are today the neglected bargains of the carnival world. 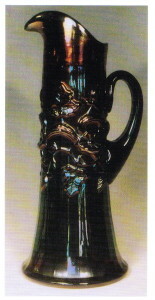 Mrs. Hartung broke pitchers down into three categories – tankards, bulbous, and table (regular) size. It should be pointed out that we can have a pitcher that is bulbous and also a tankard. The Blueberry, Strawberry Scroll, and Lily of the Valley are good examples. 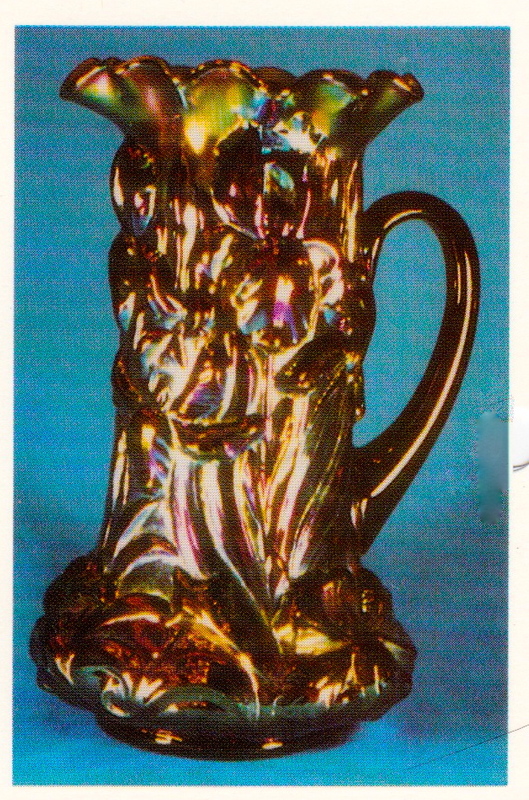 These three are tall enough to fall into the tankard class, and each of them have a multiple bulbous effect. 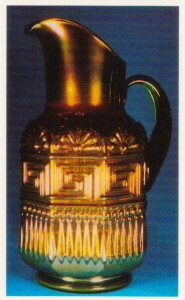 None of the pitchers with a single bulb (cannon ball type) are tall enough, as far as I recall, to get into the tankard category. Here are a few brief comments on the tankard pitchers shown in the color spread. I will list them in their order of rarity, as I see it. It’s almost a coin toss on some of these and I’m sure many of you will not agree with my rankings. That’s what makes a horse race. AMETHYST MORNING GLORY (MILLERSBURG). The top of the mountain. Nearly 14 inches of regal elegance. One known in green, three in amethyst, and three in marigold. All are super rare. WHITE WISTERIA (NORTHWOOD). Northwood’s finest. Rare in white and super rare in ice blue. BLUE LILY OF THE VALLEY (FENTON). The super star of the Fenton stable. Very rare. Five or six known in blue. The only known one in marigold was lost in the 1972 California earthquake. ICE GREEN GRAPE ARBOR (NORTHWOOD). Super rare in ice green. Rare in ice blue and blue. Scarce in white and amethyst. Available in marigold. One in green would rattle a few cages. ICE GREEN GRAPE AND CABLE (NORTHWOOD). Super rare in ice green. Rare in green. The purple and marigold no longer occupy the lofty spot they once held. ICE BLUE ORIENTAL POPPY (NORTHWOOD). 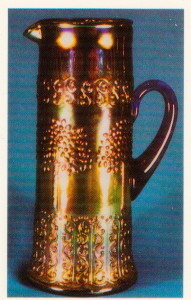 One of the most popular of the tankards. Rare in blue, ice blue, and ice green. Scarce in green, amethyst, white, and marigold. ICE BLUE DANDELION (NORTHWOOD). Another handsome running mate to the Oriental Poppy. Take your pick. Probably should have called this one “Sunflower”. Rare in ice blue, white, and ice green. Scarce in amethyst, green, and marigold. BLUE STRAWBERRY SCROLL (FENTON). A tough one to find. Exciting shape. Rare in blue. Very scarce in marigold. MARIGOLD HARVEST FLOWER (DUGAN) No doubt deserves higher ranking. Hurt by the fact it is known only in marigold. must be tagged at very rare. AMETHYST INVERTED STRAWBERRY (CAMBRIDGE). Not an exciting shape but an old pattern that collectors relate to and value. 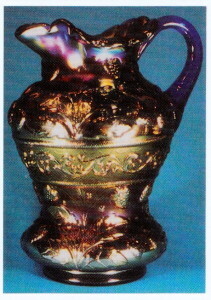 Rare in amethyst and marigold. Very rare in green. BLUE BLUEBERRY (FENTON). Much harder to find than collectors realize. Classy, pleasing shape. Very scarce in blue and marigold. Rare in white. 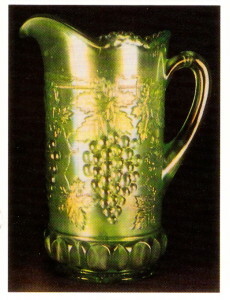 GREEN GREEK KEY (NORTHWOOD). 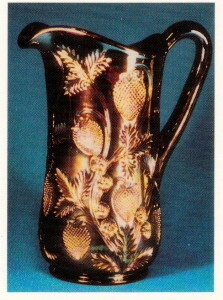 This uniquely shaped pitcher is seldom offered for sale, but still sells for less than it did fifteen years ago. 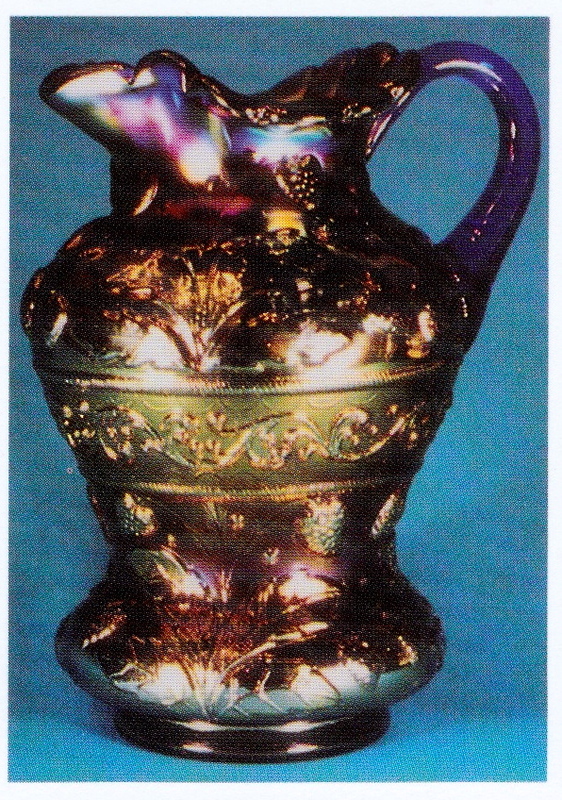 Must be called rare in all three colors – green, amethyst, or marigold. BLUE BLACKBERRY BLOCK (FENTON). A personal favorite. Pleasing, stately shape. Very scarce in blue, green, amethyst, and marigold. Rare in white or vaseline. WHITE COSMOS AND CANE (U.S. GLASS). This pattern along with the Inverted Strawberry are the two intaglio representatives. Label it very scarce in either white or marigold (honey amber). PURPLE HEAVY IRIS (DUGAN). 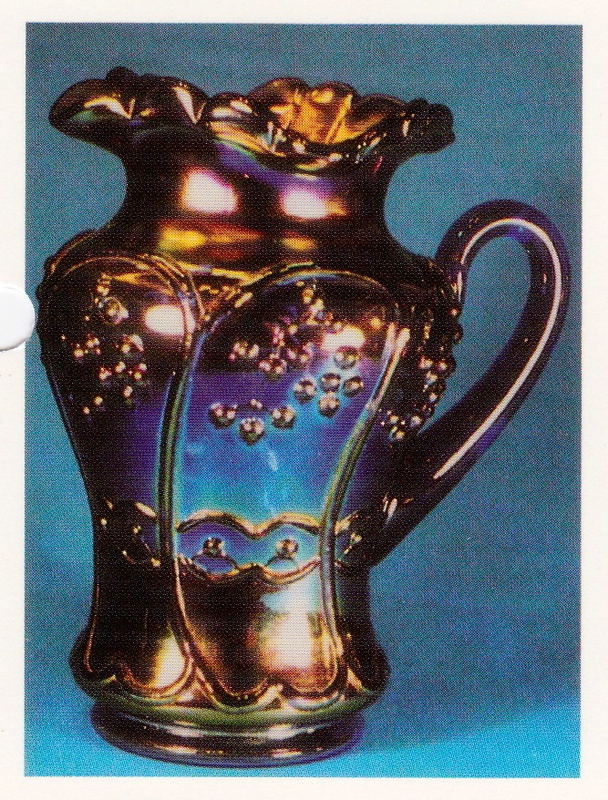 Usually offers outstanding iridescence, but reproductions have hurt. Scarce in purple. Rare in white and peach opal. Still available in marigold. 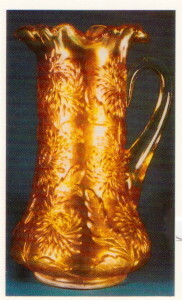 BLUE ORANGE TREE, VARIANT (FENTON). Sometimes called Orange Tree Scroll. 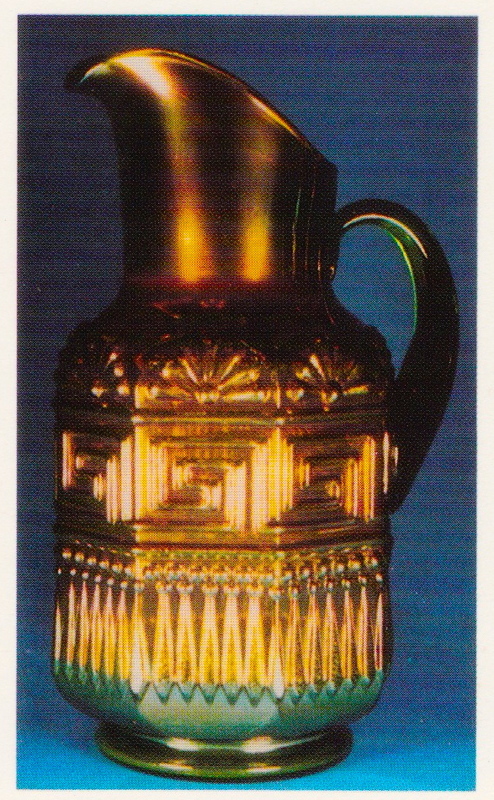 Tall and stately, but shape lacks character. Scarce in blue or marigold. MARIGOLD TEN MUMS (FENTON). Really too nice a pitcher to bring up the rear. A beauty in any color. Scarce in marigold, but must be called rare in either white or blue. This article is not intended to be all inclusive. 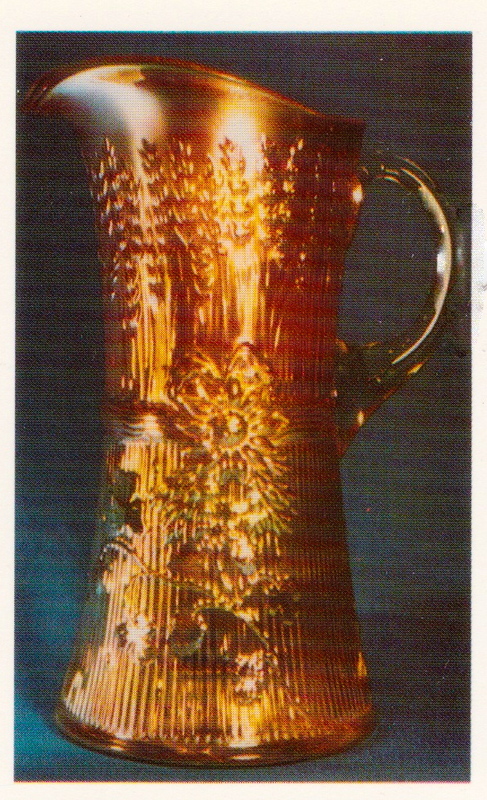 Space does not allow me to show other great examples of tankard pitchers such as Milady, Quill, Paneled Dandelion, File, Grapevine Lattice, Inverted Feather, Crab Claw and others. 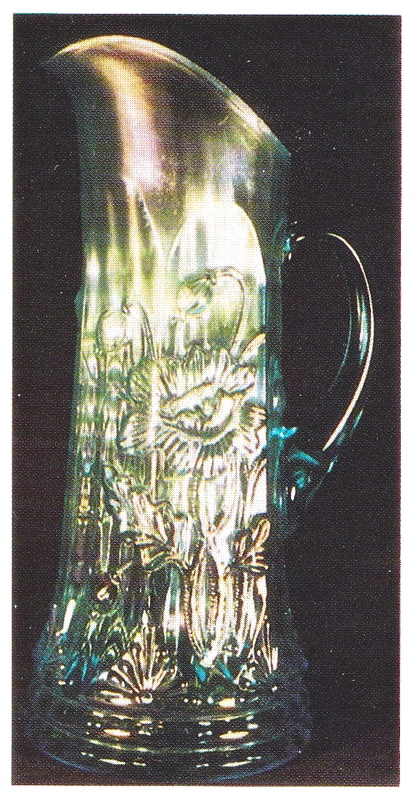 I’m sure you will have caught the theme of my comments to the effect we seem to be neglecting one of our greatest carnival glass assets.